I’m a sucker for cute bears, and this SkillOnNet offering with all the trimmings hits my sweet spot. The forest shouldn’t be a dark and disturbing place, like many fairy tales portray it, like Teddy Bears Picnic slot, it should be a happy, bright place, full of undiscovered winning coins and free spins. If you go down to the woods today, you'll be sure of a big surprise…Yes, it's the Teddy Bears Picnic Slot review, on the same Sunday afternoon each month, the teddy bears do gather for their monthly picnic. The more reels you spin and paylines you win, the more you will be rewarded. 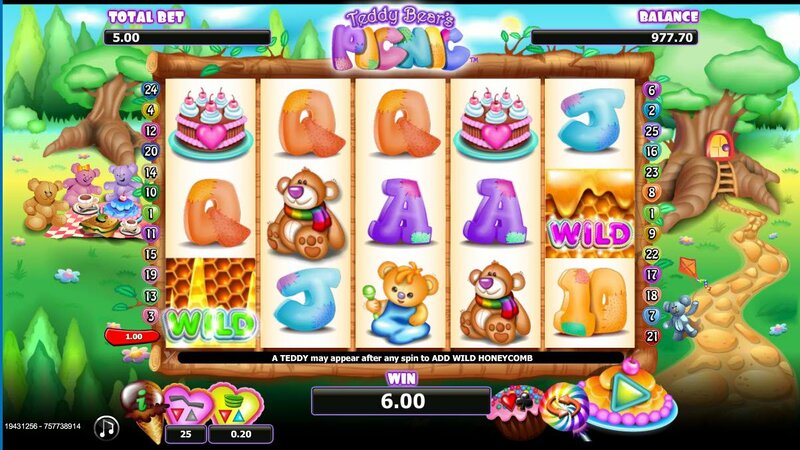 SkillOnNet really pulled it out the bag, with this cute, fun and bubbly Teddy Bears Picnic slot download, with 5 reels and 25 paylines available to dizzy you with delight. The calming sounds of birds chirping and trees making oxygen for a clean fresh breath of air, all add to the relaxed atmosphere this game provides you with, so you can reel all your paylines home into your pocket, where they belong. The typical high card number symbols just look like different coloured chunky doughnuts that should be eaten before they go stale, or let out all their delicious fillings. Looks like we have blueberry, grape, strawberry, honey, some sort of peach and perhaps the bear mummy has mixed it up and, just 'cos they look like they taste the same as they look, doesn't mean there's not a chocolate one hiding there somewhere. The picnic basket is our wild symbol, and you'll get 8 free spins, with the honeycomb sticking around to increase your winning paylines. There's a nice and lovely cake, looking too good to spoil by cutting into it, and a cup of yummy tea that looks like the teacup it is in is edible. 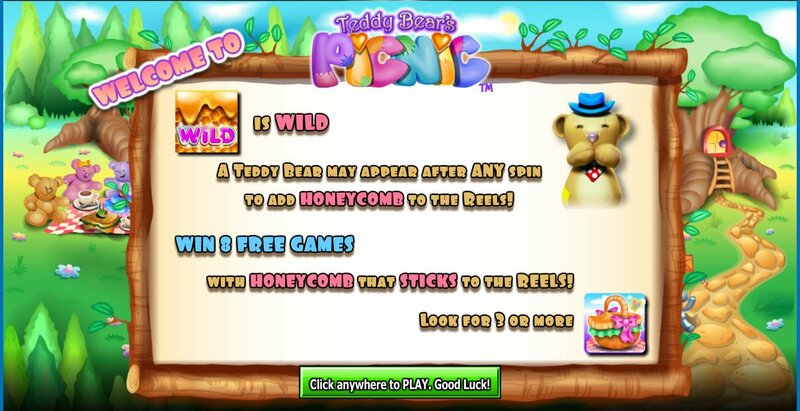 There's not just Daddy Bear, Mummy Bear and Baby Bear, there's also a Teddy Bears Picnic slot bonus, with a Teddy Bear wild that will appear in all its cuddly nature after any spin to add a sticky honeycomb to the reels. 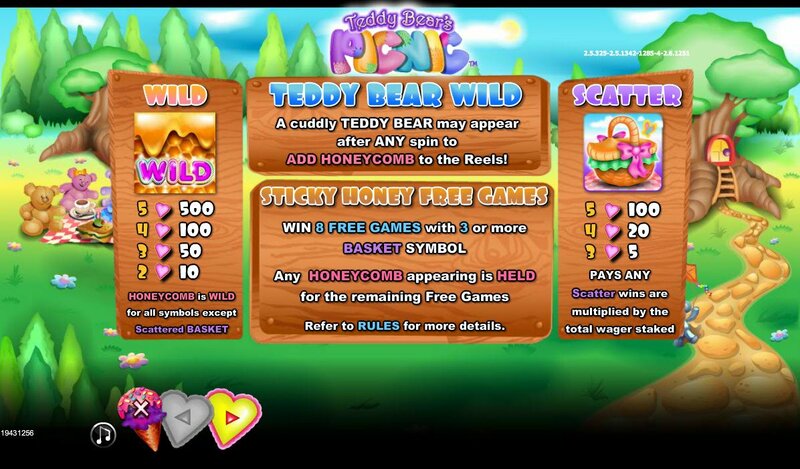 There's also that Teddy Bear Picnic slot gamble feature I love, that gives you straight odds for a bit of extra fun on the reels. Bulls and Bears Slot Review – Buy or Sell?